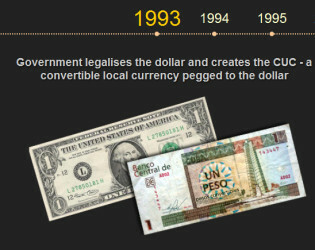 The unification of the two currencies circulating in Cuba, announced by the government but without any clear timeframes, will put an end to two decades of a dual currency system that was introduced when the country was brought to its knees by the collapse of the Soviet Union. But experts say the inequalities that emerged during the severe economic crisis will not be resolved through mere monetary reform. The following graphic provides a timeline showing the key developments in the dual currency system and the way nominal wages, revenue, savings and liquidity have evolved. An end to the country’s dual-currency system is one of the reforms most anxiously-awaited by Cubans, who nevertheless reacted with scepticism and doubt to the announcement of a timeline for eliminating the system, blamed for exacerbating social inequalities in the country.